Last week I visited Ottawa to participate in the federal budget lockup at the old train station. My mission was to produce some interesting graphics of the federal budget, showing the cuts and Canada’s overall financial picture. I’m pleased with the results, though they aren’t ideal. The federal government has an odd way of reporting finances. The budget itself is painted in the broadest strokes. 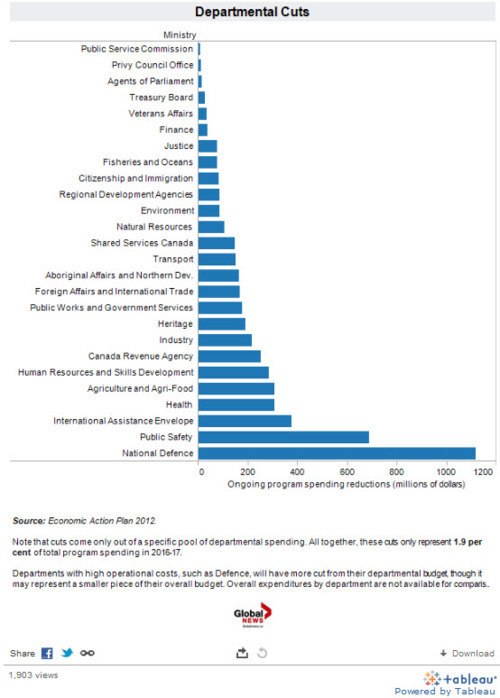 They don’t even break down finances by department, which made it tough to figure out what proportion of a department’s overall budget these cuts represented. It’s not like they couldn’t. 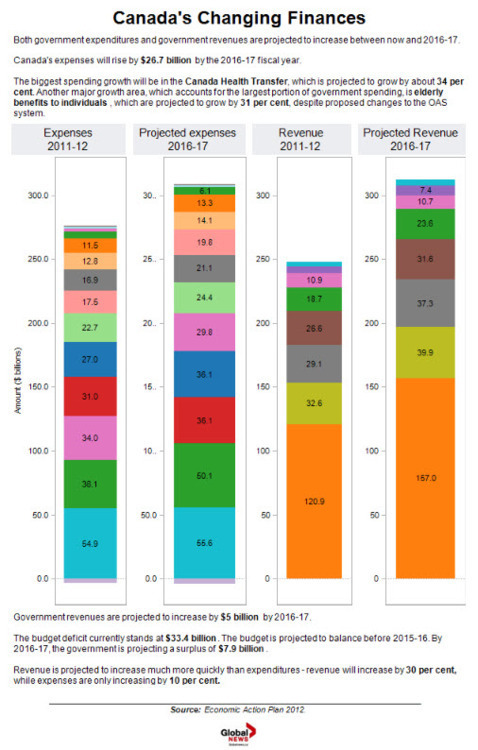 The Ontario budget, for which I did a similar graphic a few days before, does include projected departmental budgets. Comparing budget figures with existing data can be done, but it’s a bit of a minefield, since the major financial document, the Main Estimates, uses a different accounting system than the budget (or it seems, Canada’s Public Accounts). Comparing across accounting systems would skew the data and mess up the calculations. In retrospect, I might have had better luck using the Public Accounts as my comparison. A lesson for next year. I’m pretty pleased with Tableau though. Except for the fact that it was down for maintenance the night of Ontario’s budget, it’s great for making quick and attractive graphs. This entry was posted in Uncategorized and tagged budget, graphics, tableau. Bookmark the permalink.